like many other walks of life, arguments have raged for years over who could be legitimately defined as 'the best'. naturally enough, i'm talking about drummers. personally, i tend to favour those who recommend buddy rich; in terms of drive, technique and groove, it would be hard to see past this choice, though i'd agree it's perhaps not the modern day option. those of a certain age who favour the sound of the big bands cannot fail to be impressed by that of the buddy rich big band, a varying group of musicians who have managed to continue working even today based initially on the tenacity of their esteemed leader (who passed away in april of 1987), and latterly on his reputation. with the heyday of the big bands now long gone, it is testament to mr rich that the band still continues. rather obviously, in the light of his percussive skills, many contemporary professionals hold him in reverence, though rarely in light of his often fiery and disagreeable personality. to this end, modern day drum god, neil peart of progressive trio rush took it upon himself to organise, along with buddy's daughter, an annual remembrance bash, featuring some of the finest drummers around playing with the buddy's band. peart was probably the only one who initially attempted to emulate rich by having his then drum sponsor provide a kit of similar constitution to that of buddy. sadly mr peart's talent is some way short of his idol (though in his favour, i believe he'd say the same thing). in the days when vhs video tapes were king, before dvd and blu-ray could be confusingly chosen in preference to a convenient internet download, i purchased one of the early concerts featuring marvin smitty smith, a drummer who seems to have sunk without trace and steve smith, original drummer with aor stadium rockers, journey. the latter has now carved a fine career as a jazz technician and clinician and is often recognised as the modern incarnation of rich himself. for this particular filmed concert, performing with the buddy rich big band, smith opted to dress in a smart tuxedo with white shirt and sartorialy appropriate bow-tie. but in order to retain a sliver of rock'n'roll street cred, his feet were shod in a pair of reebok trainers. you can take the drummer out of a rock band ... etc, etc. this is a stance to which the folks at perren street appear to have great sympathy. it is incumbent on many a commuting businessman/woman these days to dress aptly for the job. huddling round the water-cooler and inhabiting the photocopier room more often than not demands a sober mode of dress, one that the office manager and board of directors would approve of. sadly, this rarely equates with the pelotonese who eagerly look forward to scrabbling in the mud on 'cross bikes at the weekend, troubling the algorithms at strava, or forming a speedily moving peloton in some obscure part of the countryside each sunday morning. in winter, the little oval portion of tan on the back of each hand will have faded into oblivion, leaving no outward display of the secret handshake. 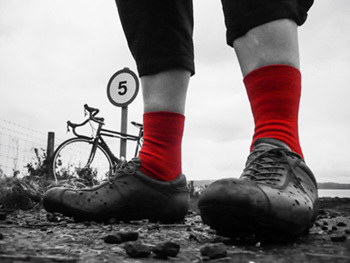 whether you dress in long shorts or a pair of cycling trousers held at bay with a trouser clip, in such chilly conditions, a pair of warmth inducing winter socks really cannot go wrong. particularly if they happen to be orange. 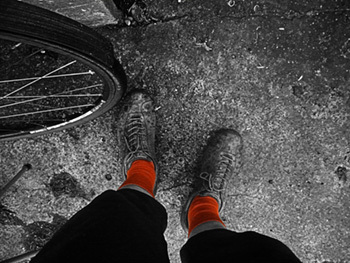 though rapha offer winter socks in both black and bright blue, if you play drums with the buddy rich big band (so to speak), you wouldn't wear anything other than orange. it pretty much goes without saying that they coddle those little tootsies with substantial warmth. 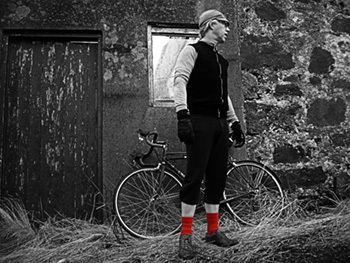 leave them all the way up and only the cognoscenti will know; turn them down at the tops and everytime you stop at traffic lights (not a practice that occurs in the southern hebrides) the civilian population will know of your rapha allegiance. i suggest having buddy's version of west-side story on the ipod.